If you're not a friend of mine on Facebook (or if you don't follow the podcast on Facebook or Twitter), chances are good that you haven't heard the news. I'm growing a person. While we are EXTRA excited with Thrilled Sauce on the side, the actual growing of the person has been more or less uneventful. It's tedious to complain about the side effects of pregnancy, so I'll spare you. You're welcome. Me: I don't understand why I'm feeling so LOUSY. I do yoga four times a week, I eat nutritious, homemade food that I cook MYSELF from scratch. I should feel AMAZING. NurseMotherofFour: Yeah... It's good that you're excercising and eating well. It just doesn't work like that. Shortly after that, we went into the room where the movie magic was going to happen. I had this idea, again, that it would be this incredibly special appointment- and it *is*, because there is PROOF that we MADE A PERSON- but it was really just a more public pelvic exam. With extra toys. And a short film at the end. 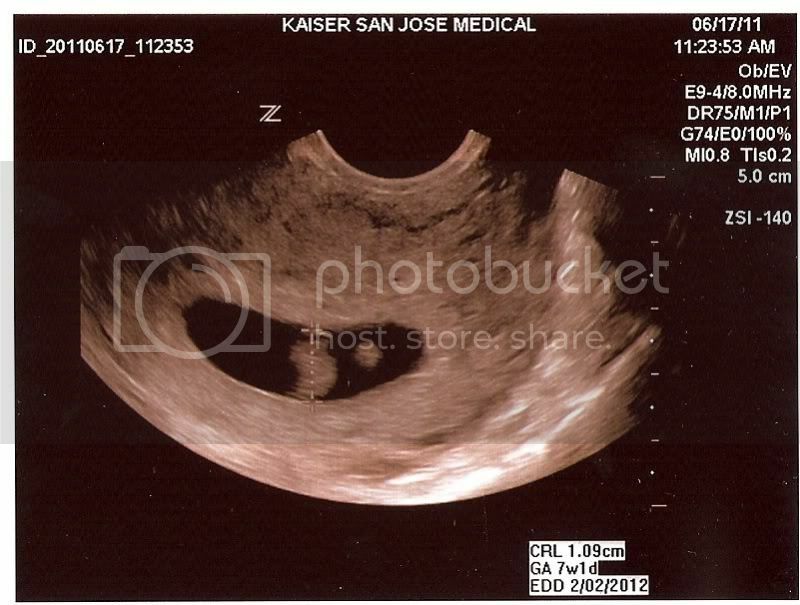 So, they show us the "baby" with the heartbeat, and really, it just looked like a flickering kidney bean to me. With a yolk sac. I wasn't really expecting little fingers and toes, but I also wasn't expecting... a legume. Dr. Stirrups (my OB) pointed out that the flickering was a strong heartbeat, and oh look, there's the yolk sac. Yolk sac. As in chickens, rays, and SHARKS have yolk sacs. I nodded at the appropriate times, but in my head, all I could think was "YOLK SAC. BABY SHARK." Andrew and I left, and over lunch we had the "which gender are you hoping for?" discussion. Andrew pointed out the benefits of having a girl, the benefits of having a boy, and then concluded that he was just excited we were having a baby. When he asked what my gender preference was, I answered, "As long as it's not a shark, I'll be happy. I'm not prepared to parent a shark." You'll have the baby but come the teen years you might very well have given birth to a shark. Says this mom of 2 teens. Oh, Jasmin! I see that reading your experiences with this pregnancy is going to be a riot. Hang on tight and enjoy the ride. (I deleted the previous post because I misspelled your name). Yay!! Your're having a bean! Just wait until that bean is bigger than a watermelon, you'll think you're having an alien. I have two toddlers and I think sometimes they are aliens! Wow! Congratulations, Jasmine! Even though I don't know you personally, I feel like I do as I have listened to you and Gigi for so long! Hope you are feeling better and can't wait to hear about and see all the knits this lucky person-to-be will receive! My darling, I love you so very much! You are a wonderful friend and I'm so happy for you both! Also, I have to thank you for making me laugh with your post today, as I'm feeling a little crazy with wedding stuff today! Please give your little Shark Peach a uterus hug for me! Knew it also...and I don't even know you (...of course I've been listening to the podcast long enough to feel like I do). Anyway, congratulations! I think Gigi would appreciate that the blogspot word verification is "sprowst" but I when I read it my brain said "schprovst" because I've been living in Munich for a year and any word that looks foreign to me I immediately read in the voice of the wee German in my head. Of course it is a yolk sac, it came from an egg. Everyone knows that the yolk is the best part. Congrats to you and your husband!! I think from now on, no matter what you actually decide Baby Knitmore's name is, will think of him/her as Sharkbean. Also, congrats! I'm so happy for everyone in the Knitmore family. I can't wait to hear more about your newest addition. If Sharkbean is anything like their mom and grandma, they're going to be awesome. I'm so thrilled for you, and Andrew, and Baby Sharkbean Knitmore, and the rest of the family! Congrats! Congrats! Gigi must be over the moon! You crack me up! I can't wait to hear/read your take on parenthood. Gotta say, the shark thing is darn close to home. My two former "legumes" are fighting like a pair of tiger sharks at this very moment. I love working with moms and all the excitement surrounding expecting a baby. If I might offer some advice, listen to yourself and your heart. Lots of people give pregnant women and new moms advice but you should do what is right to you and your husband. Also, read "The Thinking Woman's Guide to a Better Birth" by Henci Goer (see? advice!). Congratulations!!! I had a funny feeling when you left work that you might have been, and was possibly slowing down a bit and that was the reason. I am sure your mum is excited too. Now to see all the beautiful baby knits fill your queues. it will get more and more exciting with every ultrasound (o.k. it was pretty exciting for me every time since there was the risk that one twin would stop growing in the first few months) since the baby will develop further and further and then you get to see fingers and the tiny nose and so on! I got a book with pictures for every month or so (from inside the womb) and it helped me a lot but I do second Megan: listen to your heart and take it easy. Your body is doing a lot of work right now, so don't be surprised if you are tired. I'm a mom af four girls and with at least two of the pregnancies, I had dreams that I was having a dinosaur. It might of had something to do with the 23+ weeks of severe nausea/vomitting with each one. Then again, maybe I was just a bit out of my mind. I know I am now! All the best to you!! Enjoy EVERY minute- it's over before you know it. What awesome news for you and your family, Jasmin!! Today is my baby beast, uh, I mean baby girl's birthday. She is 37 today, but I so remember my pregnancy with her, and how at first, I wasn't quite up to speed. We didn't get ultrasounds back then, so I was ecstatic the first time I realized I felt her move. Enjoy every minute of it...it all passes so quickly!!! So exciting! It's a whole new chapter for all of you. Hope your feeling lousy goes away, and you enjoy the incubation period. Can't wait it watch this all unfold. This is fabulous! Congratulations! I'm also due with my first on February 29th, and was surprised by how little the ultrasound looked like a person. I had to resist the urge to say "that's it?" I came by to check out your blog and moan and groan because I'm missing your podcasts sooooo much, but now I get it and it's totally ok....well, actually it's pretty freakin' fabulous! Hope you get to feeling better soon and don't lose that sense of humor! Congratulations. That is great news. Congratulations !!! Pregnancy is a very special time (sometimes, NOT all that fun), BUT---the pay off is HUGE. My boys are 21 and 25, and the time went by way too fast!!! Enjoy it all---every second. It will all be worth it. I offer you my congratulations and please keep your sense of humor. You are going on the best ride your life & enjoy every second because the time flys. Just ask your mother.